You’ve carved all those great pumpkins! Don’t throw away the seeds — you can use them for three easy prosperity projects! 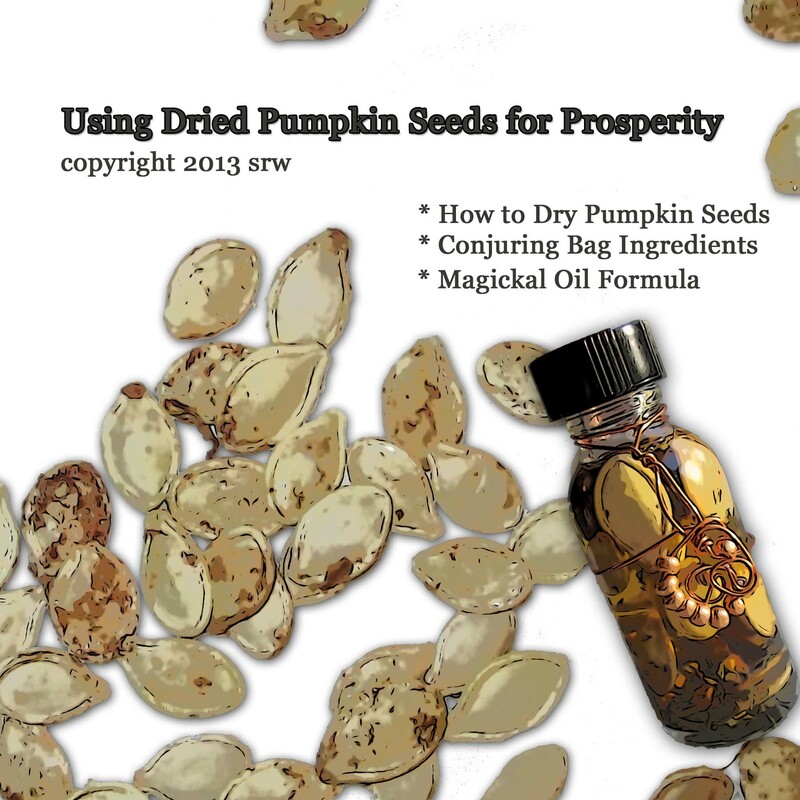 First, let’s dry and dress those seeds with my exclusive prosperity formula! Done carving your pumpkin? Hey! The fun isn’t over yet! 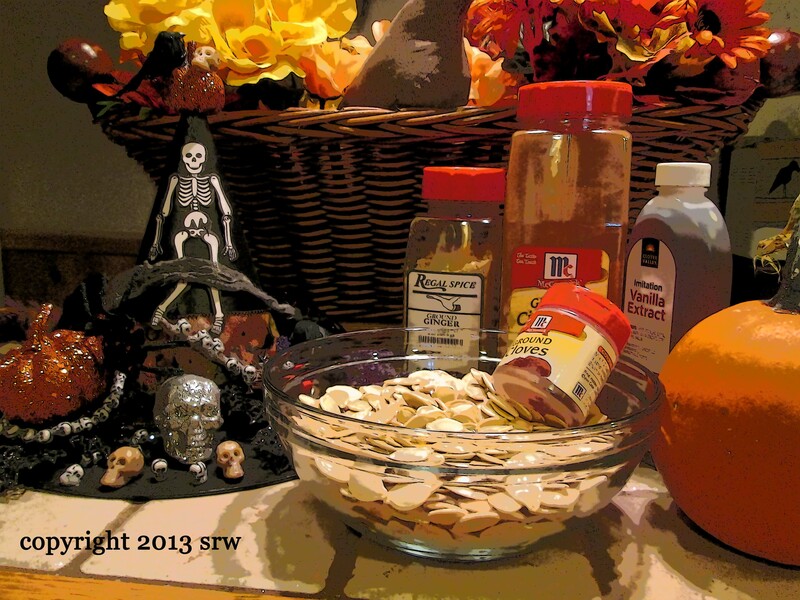 Supplies for magickal dressed pumpkin seeds — to use in oils, around candles or in conjuring bags. Next, coat seeds with the above listed formula. Time to dry them! There are two easy ways — in your oven or using a food dehydrator. 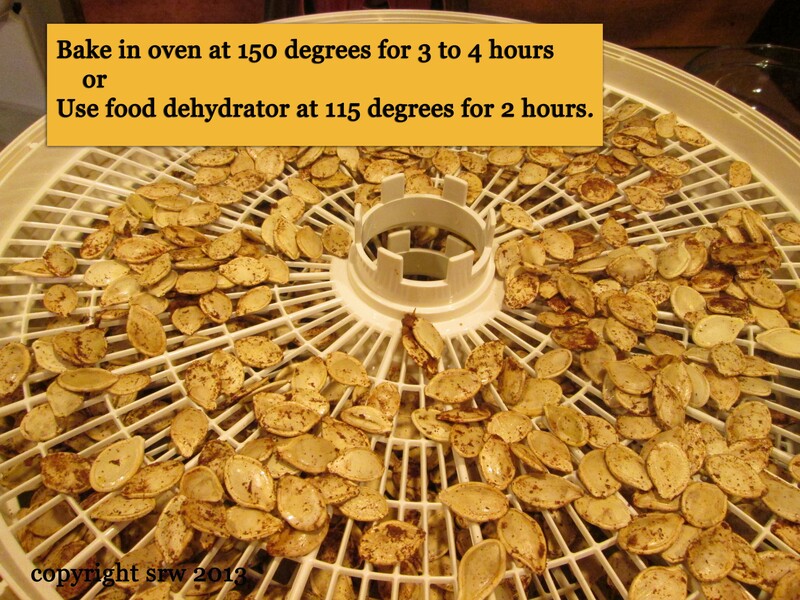 If you choose to dry your seeds in the oven, turn them every 30 minutes to avoid scorching. 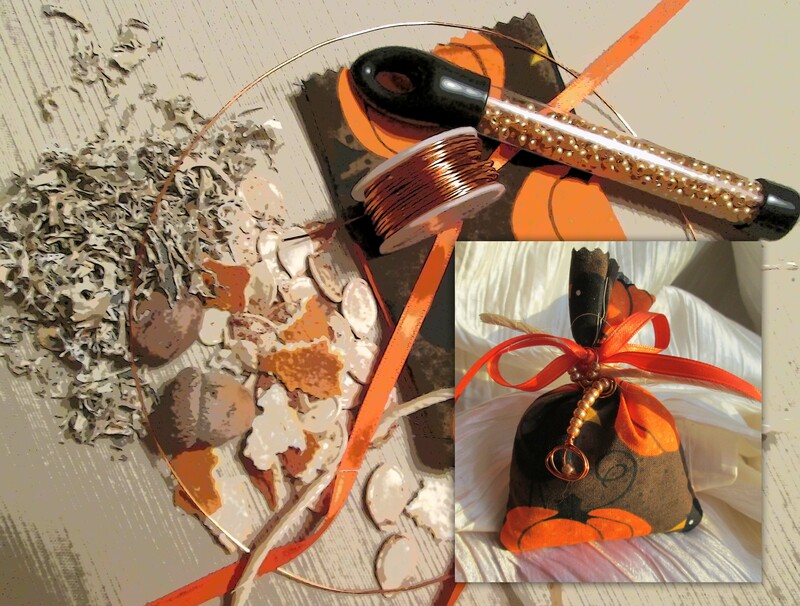 This Prosperity Conjuring Bag uses Oak Moss, one Acorn gathered from the woods, one whole Nutmeg, orange peel, a quartz crystal, and your dressed pumpkin seeds. Copper wire helps to hold the magickal charge. The golden beads, ribbon, and jute add a decorative touch. Feel free to add other prosperity herbs to your bag. Dress your conjuring bag with this great magickal oil formula! I used Jojoba carrier because it is safe, natural, and has a 100-year shelf life. Wrap the bottle with copper wire to increase the charge. A small crystal can also be placed into the bottle. Enjoy candle burning? Scatter dressed pumpkin seeds around the bottom of a green (money), gold (success), orange (opportunity), or red (fast money) candle. On the new moon, write down a wish on a piece of paper. Be specific! Place the paper under your candle holder. 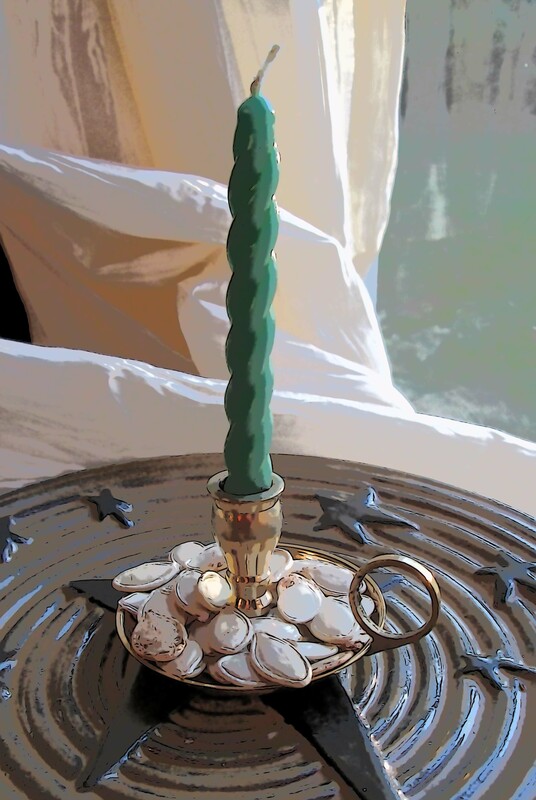 Scatter dressed pumpkin seeds around the base of the candle, rub the candle with a bit of the prosperity oil — then — set the light! 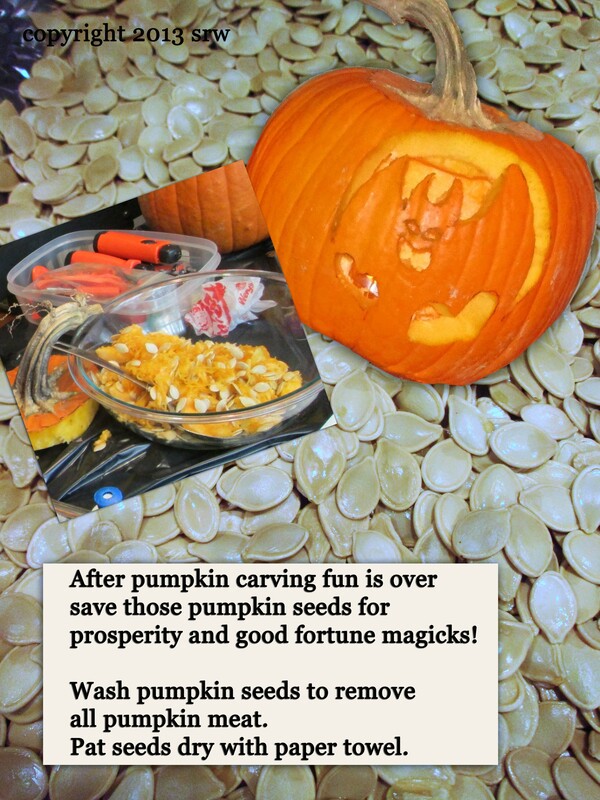 Save the remainder of your pumpkin seeds for prosperity magicks throughout the year. Your dried pumpkin seeds will last up to one year if you place them in an airtight container for storage. If you need fast money wrap the highest denomination of paper bill that you have around three pumpkin seeds. Secure the packet with copper wire or red thread. 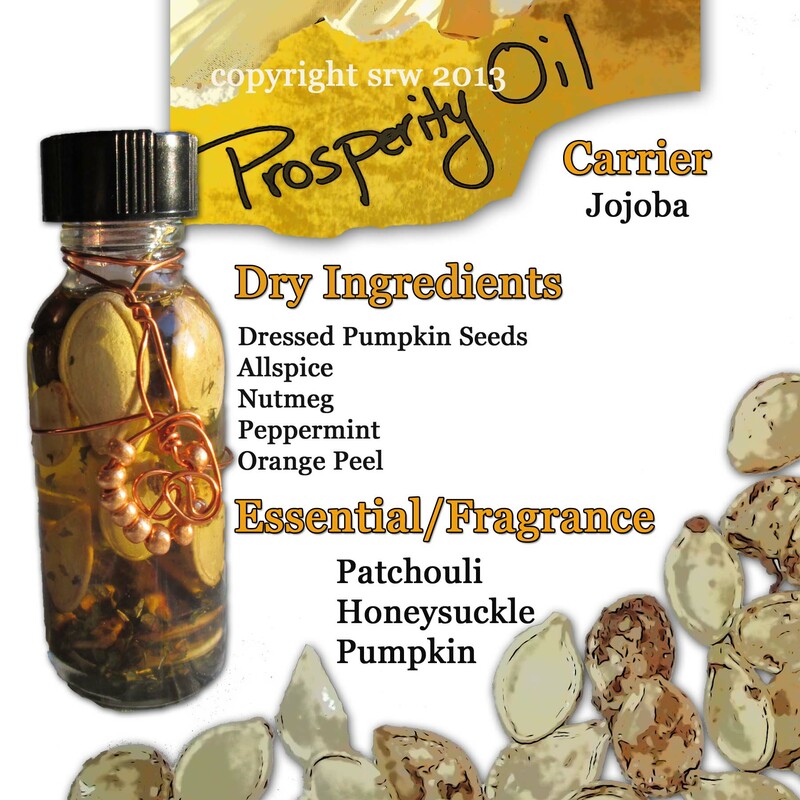 Dress with your prosperity pumpkin seed oil. Empower with a red candle. Focus on prosperity and fast cash coming to you. Add positive emotion to it! Hold on to the packet until you receive what you need. You can use the packet again, or you can unwrap it and give the original denomination bill to charity. Need prosperity for the upcoming holiday season? Scatter dressed pumpkin seeds on the front and back doorstep of your home, asking that the “winds of positive change” bring good fortune and luck to your family. Do you have more ideas for your dressed pumpkin seeds? Share them here! Victor sighed and bowed his head for a moment. The room became deadly quiet. Not a creak. Not even a tick from the clock on the mantle. The hair on the back of Victor’s neck stood up and he suddenly felt overwhelmed with an amazing flood of pure love. Victor raised his old and weary eyes, shocked to see a woman standing there. Eyes of jet, skin of chocolate, and a smile that lit the room, she bent toward him and touched the top of his head lightly. His entire body felt electrified. In the night, Victor fell ill. He passed from dream state to consciousness. In the small hours of the morning he heard the hoot of an owl far off in the woods, followed by a soft knock on his bedroom door. “Who are you?” he asked in a frightened voice as a small woman entered the room carrying an oversized basket of material, yarn, herbs and thread. After seeing to his comfort, she sat beside him in the rocking chair. “Tell me about your life,” she said. And he did. For hours she stitched, stuffed, and sewed. Sometimes nodding her head at his stories. Sometimes smiling. Once or twice, a tear drifted down her pale cheek. By dawn she was finished. And Victor had slipped peacefully beyond the veil. Midmorning found the doll maker sitting quietly in her market stall, surrounded by her precious dolls and stuffed animals. “It is what you see,” said the doll maker. The doll maker smiled. The man walked on. 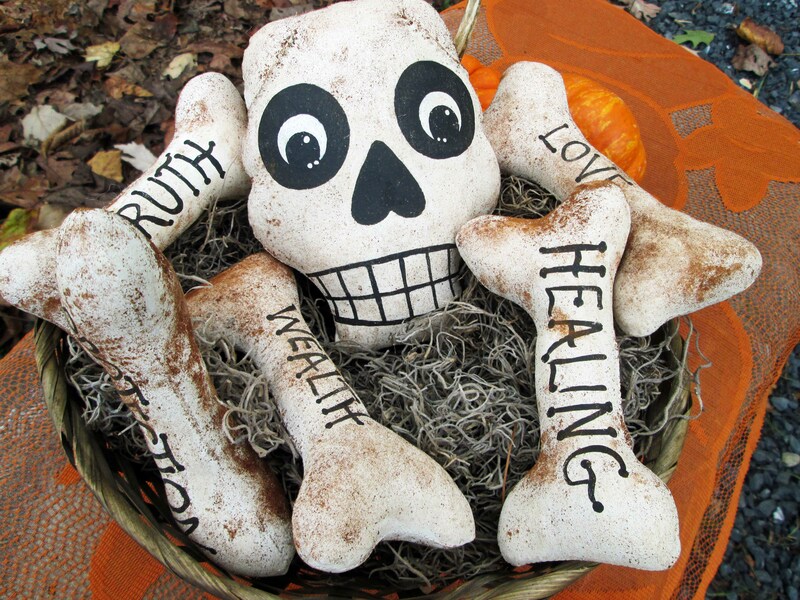 As the market was busy on Friday’s many folks stopped to look at the basket of bones. Some stared at them with curiosity. Others with distaste. A few reached their hands into the basket, and quickly pulled back as if they felt an electrical shock. No one wanted the bones. No one wanted what Victor had to share. Shadows grow early in the autumn chill. The doll maker wrapped her shawl around her shoulders and shivered. Soon, she would close up her stall. She stood stiffly, bending to pick up the basket of bones. “Wait!” came a frantic whisper. The doll maker turned to face a young boy, his hesitant face peering at her in the dusk. “How much for the basket of stuffed doll bones?” he asked. “That depends,” said the doll maker. The boy looked at her, his brow furrowed. “Victor,” said the boy. “Victor Geist. 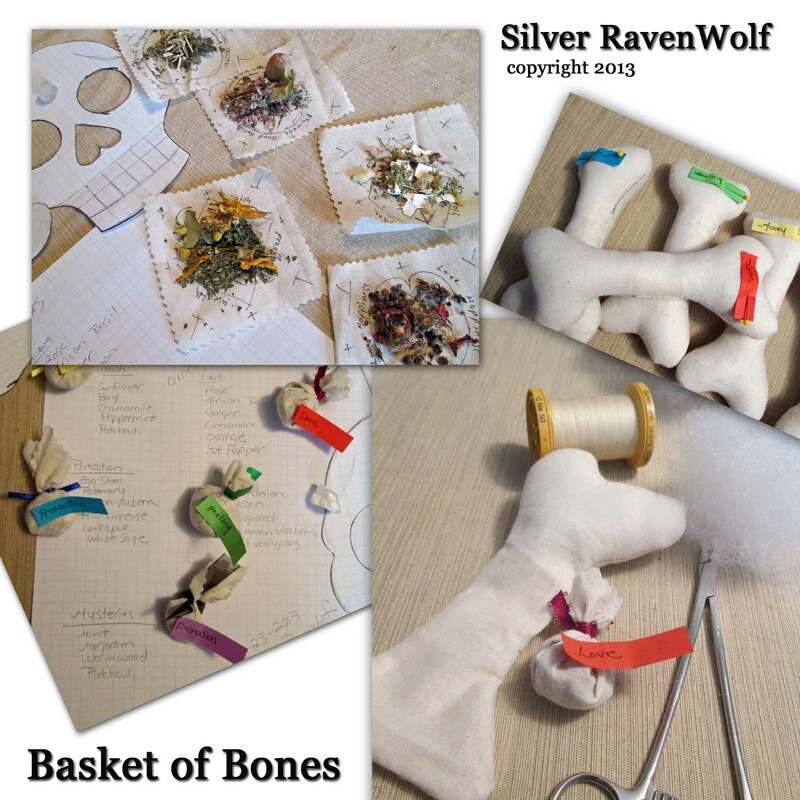 Steps for making the basket of bones.